The middle "star" in Orion's dagger - a cloud of gas and dust - in the red light of glowing hydrogen. Before life could evolve on Earth, there had to be an Earth to evolve on. With no eyewitness accounts of how our planet formed, we look for clues in the rocks. We also look for clues in space, watching how stars and planets form today. Looking at the constellation Orion, the first thing we notice is his belt of three stars. Hanging from his belt, the Hunter’s dagger is also composed of three stars. A pair of binoculars, however, reveals that the middle “dagger-star” is not a star at all, but a nebulous fuzzball. A small telescope reveals the fuzzball to be a humongous cloud of gas and dust, cradling a clutch of very young stars. Long ago, for billions of years, a similar cloud of gas and dust orbited the center of our galaxy, drifting past one star after another. Four-and-a-half billion years ago, the cloud of gas and dust drew close to a large star nearing the end of its life. Before the cloud could drift away, the star went supernova — it exploded. The explosion created oddball atoms, and shot them into the cloud — atoms we find in rocks today. The explosion also sent a shock wave through the cloud, squeezing its core, triggering the formation of a star — the sun. The new-born sun had no planets — just gas and dust, swirling around it. Matter is sticky — particles stick together, but only if they come together gently. Particles orbiting the young sun absorbed its light, grew energized, and smashed together hard — so hard, they bounced off each other. Unless the gas and dust could somehow lose energy — somehow cool — no planets could form. Tiny atoms and molecules cannot easily shed heat. Unconnected to others, individual atoms and molecules can radiate energy only in packets of specific energies — it’s as if you could pay for a purchase using only dimes — nickels and quarters wouldn’t work. Run out of dimes, and you’re out of luck. The colors of the rainbow — ROY G. BIV — red-orange-yellow-green-blue-indigo-violet — contain different amounts of energy. Violet contains more energy than indigo, indigo more than blue, blue more than green … Every atom emits its own signature colors — its own precise quantities of energy — its own quanta. This is the province of quantum physics. Flick a tiny pinch of table salt — sodium chloride — into the flame of a kitchen stove. The flame pumps energy into the salt, which the sodium atoms lose by emitting quanta of very specific energy, which we see as a distinctive orange-yellow light. Only certain atoms in the gas and dust surrounding a new-born star can emit enough energy to cool the clouds to planet-forming temperatures. 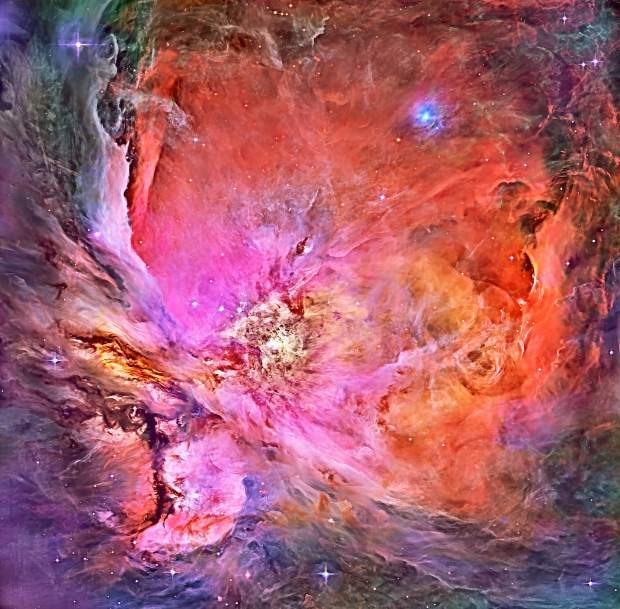 In Orion, the most important are atoms of oxygen. Oxygen loses energy by emitting quanta of green light. Local astronomers will set up scopes at the intersection of State Route 49 and the old Downieville Highway, next Saturday night if skies are clear, a week from Saturday if skies this weekend are cloudy. The green glow in Orion’s dagger is subtle, but worth looking for, an essential step in the path toward planets. Alan Stahler enjoys sharing nature with students of all ages. His science stories can be heard on radio station KVMR (89.5 FM). He may be reached at stahler@kvmr.org.